Put ribs in a roasting pan and pour over the marinade to cover evenly. Cover pan with foil and refrigerate for at least an hour (better yet overnight), turning occasionally. Bake ribs with the marinade (in pan still covered with foil) for at least 1 hour or until fork tender, turning over once midway during cooking. After this, remove foil and the cooking of the ribs can be finished outdoors in a barbecue or in the oven. 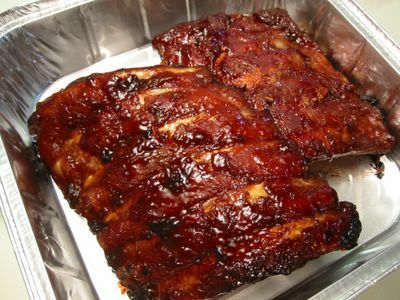 To finish cooking in the oven, lay ribs meat side down and baste with the pan juices. Return to oven and bake uncovered for 25 minutes. Turn the ribs over and again baste well with pan juices and bake for a further 25 minutes or until fall-apart tender. Dish up and serve.